After 25 years, Gilliam’s Don Quixote is finally here, and it’s a manic, muddled delight that manages to enchant. At last, Terry Gilliam’s ‘The Man Who Killed Don Quixote’ exists in the real world. What has to be one of the most well-documented troubled productions in movie history has now actually been seen by an audience. As Gilliam peevishly puts it in the opening credits, this is a film that has been ‘more than 25 years in the making and unmaking’. This seems enough cause for celebration. But what about the end result? 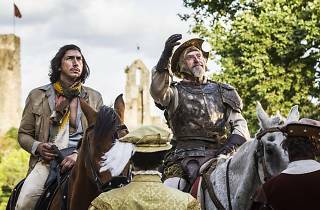 In what is a perfect marriage of material and director, Gilliam adapts Miguel de Cervantes’s ‘Don Quixote’, the 16th century novel charting the madcap exploits of a deluded knight errant who goes on a series of quests that are doomed to fail. It’s easy to see why such a character would appeal to Gilliam, himself setting out on a movie-making quest that sent him, like Quixote, into the Spanish wilderness on a journey seemingly without end. 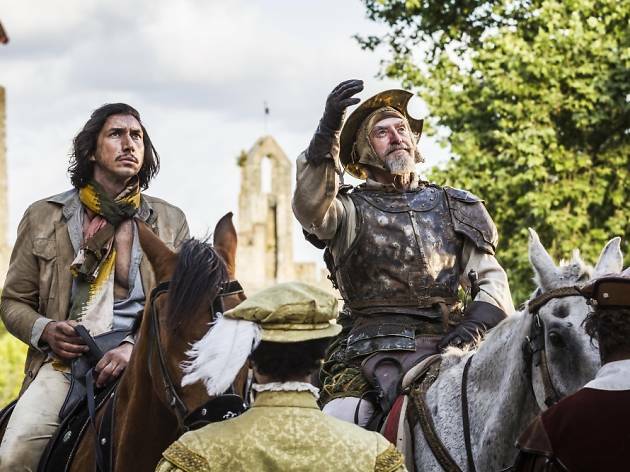 The plot follows a sell-out director, Toby (Adam Driver on top form), who’s abandoned movies in favour of commercials, currently working on a ‘Don Quixote’-themed ad on the planes of La Mancha. Toby wasn’t always so cynical. He had come to the area ten years earlier to shoot his student film, a black-and-white ‘Quixote’ adaptation where he cast as the chivalrous knight a local shoemaker, Javier (Jonathan Pryce), who subsequently turns out to be a committed method actor. Abandoning the commercial shoot, he returns to the place where he had first dreamed of becoming a director, only to discover that Javier now believes he really is Don Quixote and that Toby is his squire, Sancho Panza. After accidentally causing a fire and pinning a crime on a local hawker of rip-off DVDs, Toby finds himself hunted by the police, having to ride out into the desert with Quixote, ending up on a series of slapstick adventures where reality and fiction are only a hair’s breadth apart. This is a movie about movies, within a movie, all told in joyously messy manner, with a Monty Python-esque madness. Even if it doesn’t always come together, it does entertain, bearing all the hallmarks of Gilliam’s gleefully barmiest projects such as ‘The Adventures of Baron Munchausen’, and echoing the themes of ‘The Fisher King’. There is even a touch of his (again troubled) adaptation of Berlioz’s opera ‘Benvenuto Cellini’, that played a few years back at the ENO. Inventive and anarchic, but by no means Gilliam’s masterpiece, ‘Quixote’ reminds us of the romantic ideal that the world needs dreamers who dare to defy convention.